Good evening fellow scrappers! Today I'm sharing a page that I made for the latest challenge going on over at Bird Is The Word (BITW). I was given the opportunity to guest design for them & I'm very grateful for the chance! Thank you again Wendy. I received an either/or challenge. I had to use either the word 'Look' or 'See'. As you can tell from my title...I went with 'Look'. I did much distressing, ripping & wrinkling on this page. The edges of the page were distressed with my Zutter Distrezz-It-All. TIP: To create the large wrinkle effects shown in this close up--first wet the paper with water. I have a 2 oz mister bottle by Ranger that does a great job at wetting the paper just right for this kind of technique. Once the paper is wet simply wrinkle it up with your own fingers. Don't be afraid to scrunch away. Once you get the wrinkles just how you want them take a heat gun to it & dry it up. The paper dries wrinkled & stays that way. The chippie is by Dusty Attic. I left it raw for this page--meaning I didn't ink or paint it. All I did was heat emboss it with some Star Dust transparent embossing powder by Stampendous & added a couple of rhinestones to further decorate it. The clock was cut with Tim Holtz's die called Weathered Clock & grungeboard. I then inked it with a medium coat of molding paste and randomly spread a bit of gold embossing powder & Fake Bake Enamelz by Shimmerz. Then I took my heat gun to it & heat embossed it. By using the molding paste the embossing powders dry with a much more 'puffier' texture which I really enjoy on masculine pages. A closeup of the journaling & the metal flowers. Journaling was printed on vellum from my computer & then manually ripped out. The rest of the title was done with my Dymo Caption Maker & letters from my stash. The flowers are a combination of metal mesh & mulberry flowers. I have thin metal mesh in my stash that I used with my Big Shot & the Tattered Floral die by Tim Holtz. To define the petals of the metal flowers I added a bit of puffy paint to the edges & heat set them. I printed the photo four times & randomly layered them. The photo is matted with scraps of paper that I manually & randomly ripped. I also tucked a bit of burlap in either corner. Here you can also see the large metal mesh flower that I combined with aluminum foil. The aluminum foil layer of the flower was made by utilizing the same technique I showed in my 'Faux Metal & Acrylic Flower' tutorial. You can find that tutorial here. Only difference is that for this photo I did not incorporate any acrylic. Thanks to all of you who stop by for a visit. Your time is always greatly appreciated. Do feel free to stop by BITW & check out their challenges. Really wonderful, like ist so much! 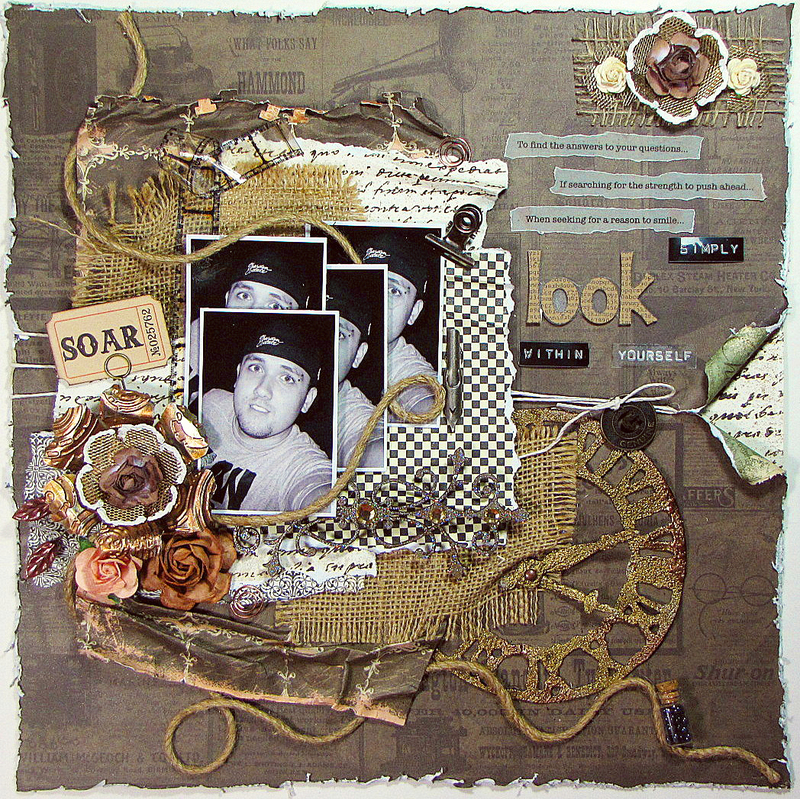 Kay you did a super fabulous masculine layout! GREAT JOB! Wonderful masculine layout. Love your style.